Pine boughs and excitement perfume the air in the little cabin in the Wisconsin woods. It's nearly Christmas! Experience the sights, sounds, smells, and joys of a prairie Yuletide as you join the Ingalls family around the tree. Read unabridged holiday stories from the beloved Little House on the Prairie series including: "Christmas in the Big Woods," "Christmas on the Prairie," "Christmas at Plum Creek," "Christmas for Farmer's Boy," " Christmas During Long Winters," "Christmas in the Golden Years," and "Jingle Bells." A gorgeous and festive collection of Christmas stories from the prairie! Celebrate the season with holiday tales from the life of Laura Ingalls Wilder, author of the beloved Little House series. Featuring Garth Williams’ classic artwork in vibrant full color! 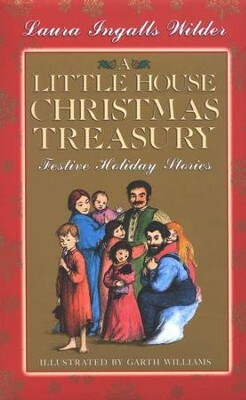 I'm the author/artist and I want to review A Little House Christmas Treasury.